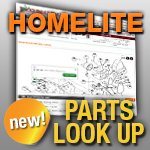 Jack’s has a large selection of replacement Lawnmower belts for your Homelite Lawn Tractor. Trust Jack’s for all your Lawnmower replacement part needs! With great prices and fast shipping Jack’s is your first choice for all your lawnmower parts needs.